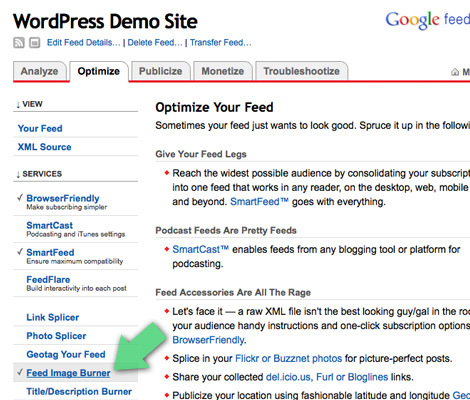 In the Simple Feed Stats plugin, Open Tracking enables you to track any web page or feed anywhere on the Web. This is done by using the open-tracking URL as the src for any <img> tag. The SFS plugin then collects and displays the data, and provides shortcodes and template tags to display your feed stats anywhere on your site. In this post, we’ll see how to implement Open Tracking, walk through some examples, and glean a few tips along the way. Once data is collected, it will be displayed in the SFS Settings page. Visit the Template Tags & Shortcodes panel for info on displaying the stats publicly on your site. 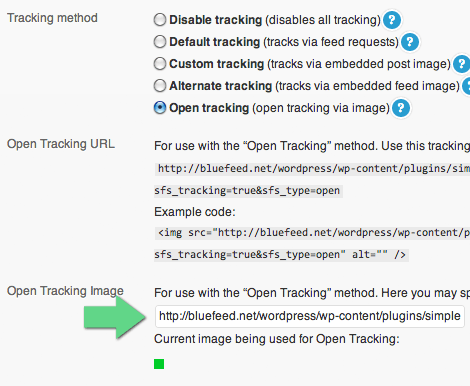 After saving your settings, the plugin will deliver your custom tracking image while silently tracking your web pages and/or feeds. Let’s look at some specific examples..
To track a WP-generated web-page (or feed), simply add the tracking image and you’re good to go. This may be done directly inside of a post, or via theme template files such as sidebar.php, footer.php or wherever. 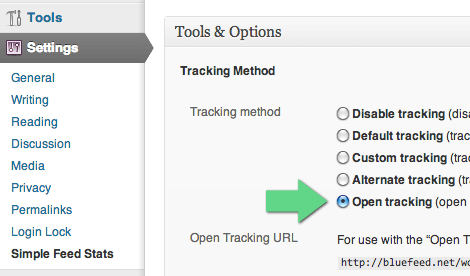 Once the tracking code is in place, you may change the image that’s displayed by entering its URL in the “Open Tracking Image” field. 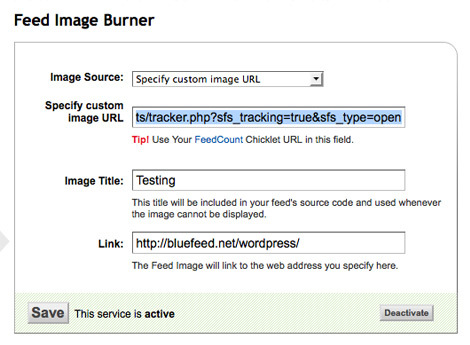 To track a normal/non-WP web-page (or feed), add the tracking image as described above and you’re done. Note that the image’s position in the source code may determine whether or not certain visits are recorded. Specifically, some requests may be interrupted before the page loads completely. If the tracking image appears near the beginning of the source code, it has a better chance of being recorded than if located near the end of the page. Does it make sense to record hits for incomplete page loads? I don’t know, but it seems worth mentioning FYI. Step 3: After saving your settings, the tracking will be in effect. Try loading your FeedBurner feed a few times and then verify the stats in the SFS settings page. Remember, by default the plugin displays a green square for the tracking image, so you’re encouraged to replace that with your logo or whatever makes sense.